The UAE General Civil Aviation Authority (GCAA) published the final report of their investigation into the September 2010 fatal accident involving a UPS Boeing 747-400F. The report amongst others indicates that the captain had to leave his seat in search for portable oxygen in the smoke-filled flight deck. After which there was no further CVR information that indicated any further interaction from the Captain for the remainder of the flight. The flight then took from Dubai at 18:51. The First Officer was the Pilot Flying, the Captain was the Pilot Non Flying (PNF) for the sector to Köln/Bonn-Konrad Adenauer Airport (CGN), Germany. Twenty two minutes into the flight, at approximately 32,000 feet, the crew advised Bahrain Area East ATC that there was an indication of an on-board fire on the Forward Main Deck and declared an emergency. The captain elected to return to Dubai and obtained clearance for the turn back and descent. A cargo on the main cargo deck had ignited at some point after departure. Less than three minutes after the first warning to the crew, the fire resulted in severe damage to flight control systems and caused the upper deck and cockpit to fill with continuous smoke. The crew advised Bahrain East ACC that the cockpit was ‘full of smoke’ and that they ‘could not see the radios’, at around the same time the crew experienced pitch control anomalies during the turn back and descent to ten thousand feet. The smoke did not abate during the emergency impairing the ability of the crew to safely operate the aircraft for the duration of the flight back to Dubai. On the descent to ten thousand feet the captains supplemental oxygen supply abruptly ceased to function without any audible or visual warning to the crew five minutes and thirty seconds after the first audible warning. This resulted in the captain leaving his position. The captain left his seat and did not return to his position for the duration of the flight due to incapacitation from toxic gases. The first officer, now the Pilot Flying could not view outside of the cockpit, the primary flight displays, or the audio control panel to retune to the UAE frequencies. Due to the consistent and contiguous smoke in the cockpit all communication between the destination and the crew was routed through relay aircraft in VHF range of the emergency aircraft and Bahrain East ACC. Bahrain East ACC then relayed the information to the Emirates ACC in the UAE via landline, who then contacted Dubai ATC via landline. As the aircraft approached the aerodrome in Dubai, it stepped down in altitude, the aircraft approached Dubai runway 12L, then overflew the northern perimeter of the airport at 4500 ft at around 340 kts. The pilot could not view the Primary Flight Displays or the view outside the cockpit. The pilot was advised Shajah International Airport was available at 10 nm. 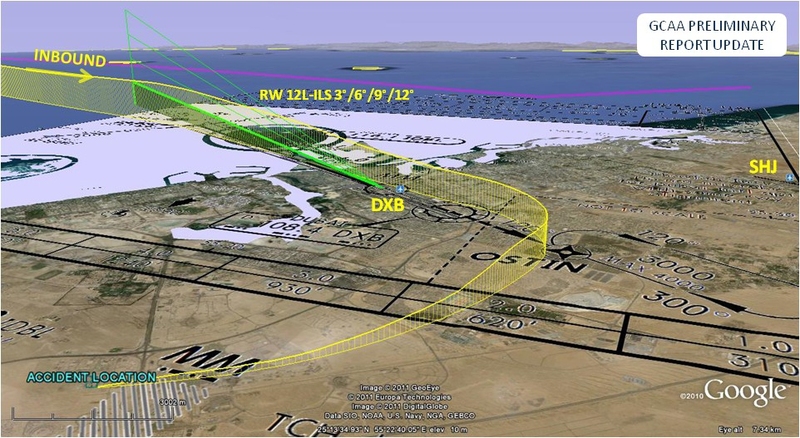 This required a left hand turn, the aircraft overflew DXB heading East, reduced speed, entering a shallow descending right-hand turn to the south of the airport before loss of control in flight and an uncontrolled descent into terrain, nine nautical miles south west of Dubai International Airport. The shutdown of PACK 1 for unknown reasons resulted in loss of conditioned airflow to the upper deck causing the Electronic Equipment Cooling [EEC] system to reconfigure to “closed loop mode”. The absence of a positive pressure differential contributed to the hazardous quantities of smoke and fumes entering the cockpit and upper deck, simultaneously obscuring the crew’s view and creating a toxic environment. A total of 36 new safety recommendations were made. These recommendations related amongst others to cargo container fire suppression methods, crew oxygen and crew vision during a smoke event, and the classification of Lithium-based batteries as a class higher than ICAO Class 9 hazardous material.